There is a certain logic in Israel’s actions. A population under military occupation does not need anything except the most rudimentary education. All it needs to do from the Occupier's perspective is to learn to obey. The purpose of Palestinians in Area C, which Israel retains full control over, is to provide cheap labour for Israel’s agri business. You don’t need to read to pick dates or olives or to plant seed. Indeed education can be dangerous because it helps people think about their own situation. When Nazi Germany invaded Poland for the first two years it exterminated the Polish intelligentsia – priests, teachers, academics, civil servants etc. More Jews died in this time because they were Polish intellectuals than because they were Jews. The Nazis held that the Poles were a slave nation. Independence or self-rule was out of the question. Their only role was to work for their Nazi overlords. There was no need for education or learning or for that dangerous species – the intellectual or member of the intelligentsia. Even in Victorian England working class children were taught to read only, in order that they could read instructions. Writing was unnecessary. Israel operates according to the same ‘logic’ as the Nazi overlords of Poland. Hence the quite genuine anger in Tel Aviv that the European Union continues to fund ‘illegal’ Palestinian schools. In Area C, the 60% of the West Bank that Israel fully controls, it is illegal to erect a building or solar panels or sink a well or indeed do anything that constitutes economic activity by the Palestinians unless you have a permit. Permits are rarely granted. Of course the Jewish settlers do not need a permit. They operate under an entirely different legal system. ‘Apartheid’ I hear you cry? Nonsense. It’s Separate Development except that the Jewish part develops at a greater rate than the non-Jewish. They used to call it Separate but Equal until the US Supreme Court in Brown v Board of Education decided that if it was separate it was unlikely to be equal. Israeli society and the occupation is still at a stage somewhere before 1954 when Brown was decided. Israel, it has to be said, is very angry at the Dutch government and the EU generally for funding things like schools and homes when such things are quite contrary to Israel's occupation policy. Indeed some souls have suggested that this policy is 'anti-Semitic'. It is something that I shall not comment on! B’Tselem said that Civil Administration’s actions left 80 elementary school pupils in Jub a-Dib without any place to study near their homes. On the eve of the new school year the IDF this week destroyed two illegally built modular Palestinian and Beduin schools funded by the European Union. On Tuesday evening, the Civil Administration of Judea and Samaria took down a building made up in six caravans in the village of Jub al-Dib near Bethlehem. 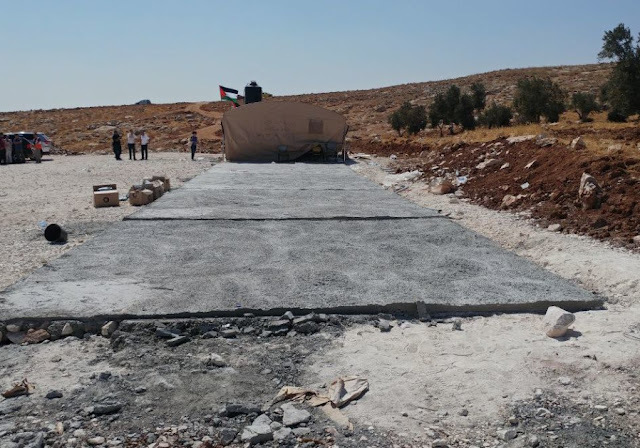 On Sunday demolished a one-room modular kindergarten in the Beduin herding village of Badu al-Baba near the town of Eizariya just outside of Jerusalem. In both cases the Civil Administration said the structures lacked permits. “The building in Jub al-Dib was built illegally last weekend, a blunt violation of stop work orders and without receiving the required permits. Therefore, the confiscation was carried out in accordance to the Civil Administration’s authorities,” it said. Of the kindergarten Eizariya it said “an illegal tin and wood shed was found in Eizariya, that was established over the past two weeks without receiving the required permits. “The shed was confiscated by virtue of the procedure to confiscate caravans and in accordance to the law. We would like to emphasize that the construction was not in use,” the Civil Administration said. Israeli information center for human rights, B’Tselem, said that Civil Administration’s actions left 80 elementary school pupils in Jub al-Dib without any place to study near their homes. In past years they had gone to the nearby village sou Dar Salah and Beit Ta’mir. “The demolition of a school building the night before the start of the year epitomizes the administrative cruelty and systematic harassment by authorities designed to drive Palestinians from their land,” B’Tselem said. It noted that in June the Civil Administration had confiscated solar panels from Jub al-Dib funded by the Dutch government. Palestinians and Beduin in Area C receive very few construction permits from the Civil Administration. As a result the EU has said helping them with housing is a humanitarian gesture allowed under international law. On the evening of Tuesday, 22 August 2017, at around 7:00 P.M. Israeli Civil Administration officials and security forces arrived at the village of Jub a-Dib, southeast of Bethlehem. The forces demolished the community's recently constructed school building. The demolition, which ended around midnight, took place the night before the start of the Palestinian school year, and left eighty pupils without an educational facility. In previous years, the children of Jub a-Dib had to walk to school in the Dar Salah and Beit Ta'mir areas, outside the village. The demolition of a school building the night before the start of the year epitomizes the administrative cruelty and systematic harassment by authorities designed to drive Palestinians from their land. In late June, the Civil Administration confiscated solar panels installed in Jub a-Dib by Israeli-Palestinian nonprofit Comet-ME and financed by the Dutch government, after Israel consistently shirked its obligation to connect the village to the electric grid. The school consisted of six pre-fabs donated by the European Union, that the security forces dismantled and confiscated. The area was declared a closed military zone, and security forces used stun grenades to keep residents away. Recently, Israeli authorities damaged two other educational facilities in Palestinian communities: in Abu a-Nuwar, on 9 August 2017, the Civil Administration confiscated solar panels donated by the international community, that provided electricity to the school and kindergarten. On 21 August 2017, at around 5:00 A.M., Civil Administration personnel accompanied by around fifty soldiers, Police and Border Police officers arrived at the Badu al-Baba community which is located near al-‘Eizariyah, northeast of Jerusalem. They dismantled and confiscated a pre-fab that had been placed there around three weeks prior, to serve as a kindergarten for 25 local children aged 4-6, who do not have an alternative educational facility. The forces confiscated the equipment in the kindergarten: 10 desks, 30 chairs, two cabinets and a blackboard. The caravan and equipment were funded by the community and valued at approximately NIS 10,000. Seven months ago, our village was connected to a regular power supply through solar panels. That helped me because I really need electricity for my studies, for example in order to use a computer. Until then I had to stay at college until late, and sometimes at night, in order to use the computer. So I was really glad when they connected our home to the electric supply. After the connection I could work on the computer at home, and when it was hot I could put a fan on. I spent hours working at home, downloading projects and uploading photos and video clips. The general quality of life at home improved. We bought a fridge and a washing machine. Until then my mother had worked very hard to wash all our clothes and suffered from that. We also began to watch television together as a family and to surf the internet. We were very happy – until yesterday, 28 June 2017. The Civil Administration and the army arrived, dismantled the solar panels, and left the village without electricity. I saw it happening and tried to document what they were doing, but one of the soldiers got in my way, so I only managed to document part of the incident. After they dismantled the solar panels I was in a state of shock. I was so disappointed. I thought about how much my family has suffered over the years because of the lack of electricity – how we spent the nights in darkness and suffered in the heat without fans. Worst of all, I thought about how I’d have to stay late at college again to study and work on my projects, and find a way to get back to my remote village that doesn’t have any public transportation. Now things will be hard for me again. I don’t know what I’ll do until I finish my studies next year. How do you tell if someone is a Nazi?